Wow. Much race. So love. 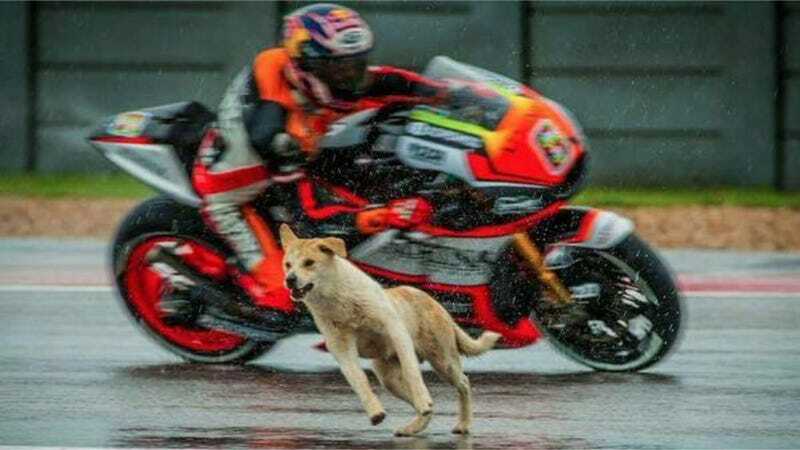 This week saw a happy ending to the tale of the stray Shiba Inu mix who interrupted a practice session for the MotoGP of the Americas race in Austin. The Austin Animal Center reports that our furry friend who leans in to turns about as well as the racers has been adopted. Volunteers working with the local shelter named the dog Moto after his on-track escapades. Moto is an adorable one-year-old puppy who is sure to being his new owners lots of love. He was adopted only a week after being at the shelter. We recommend investing in some fences or a leash if he’s coming back around the track, though—just in case. If you’re looking for a loyal shop dog, you can’t go wrong with rescuing a shelter pet. If you’re in the Austin area, there’s plenty of other animals waiting for adoption at Moto’s shelter. Show them some love! Update: The owner chimed in on Austin Animal Center’s Facebook page to say he adopted the dog after a trackday at COTA (fitting!) and has renamed the dog Rossi. D’awwww.